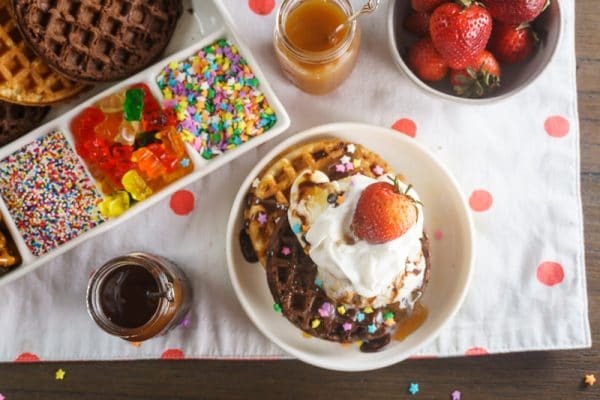 Waffle Sundae Bar - Waffle, Ice Cream, & Fun Toppings - Get creative! By now, you all know I love ice cream. Ok, I love all desserts. And I’ve been looking for some new fun activities for our family nights. So when I got a peek at the new Cool Foods promotion at Publix, I immediately knew what I’d be making. 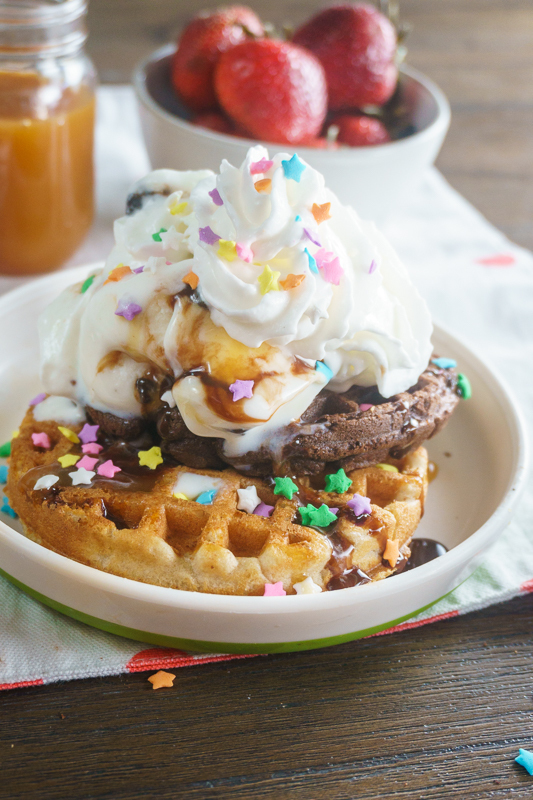 Waffle sundaes! 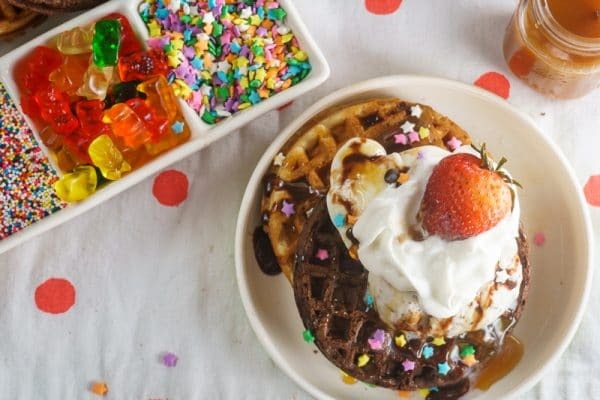 So what is a waffle sundae? If you’re asking this, you’ve really been missing out all your life. 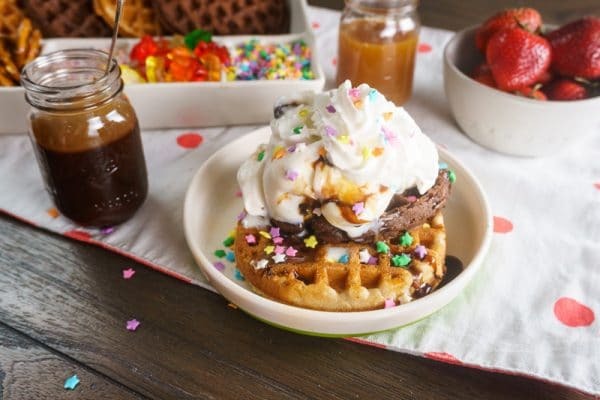 A waffle sundae is exactly what it sounds like – a toasty waffle topped with ice cream and all the delicious toppings your imagination can muster. As you know, I love shopping at Publix. It’s always so clean, the food is always fresh, and the people are just so darn nice. As a food blogger – I buy a whole lot of food. So, I try to keep an eye on all the awesome promotions at Publix. And it was their latest Cool Foods promotion that inspired this whole post. It’s like this sale was just intended for making waffle sundaes! First, the waffles. 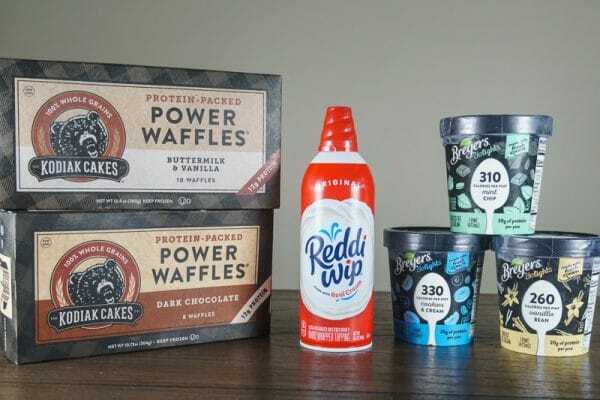 I was super excited to try out these Kodiak Cakes Power Waffles. 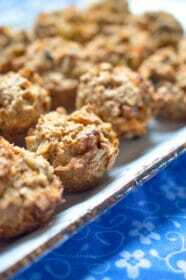 I love these because they are quick and easy to make in the toaster, and they come in all kinds of fun flavors. Who wants a plain waffle when you can have Buttermilk & Vanilla or Dark Chocolate waffles? 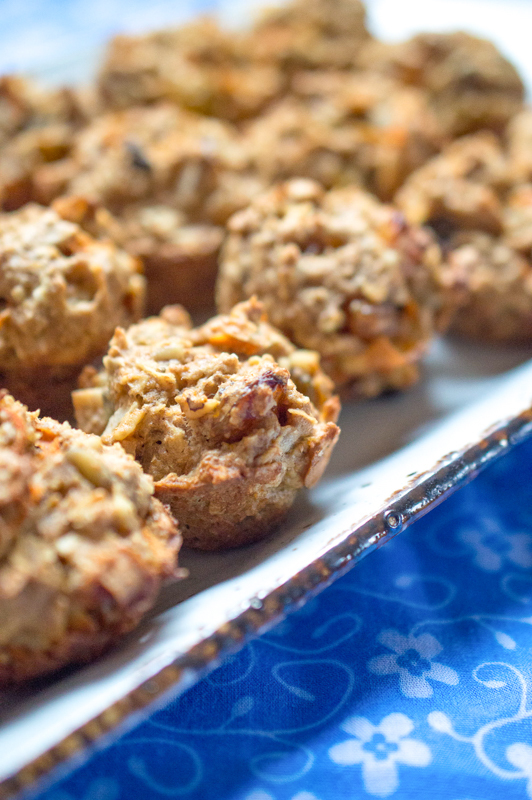 Plus, they’re packed with protein, so they make a great power breakfast too! Next, the ice cream. It’s sort of essential for a sundae. I was really in luck, because there are a bunch of great ice cream varieties included on this promotion! I went with the Breyers Delights ice cream. I love that they’re pint-sized, so I can easily try out a whole bunch of different flavors. And finally, the whipped topping! Reddi-Wip is also on sale, and it’s obviously the only way to top off any decent sundae. Can you believe all of this awesome stuff is on sale at the same time? Make sure you check out the Cool Food promotion at Publix from 10/13 – 10/26. You can see the full list of participating products on the website. 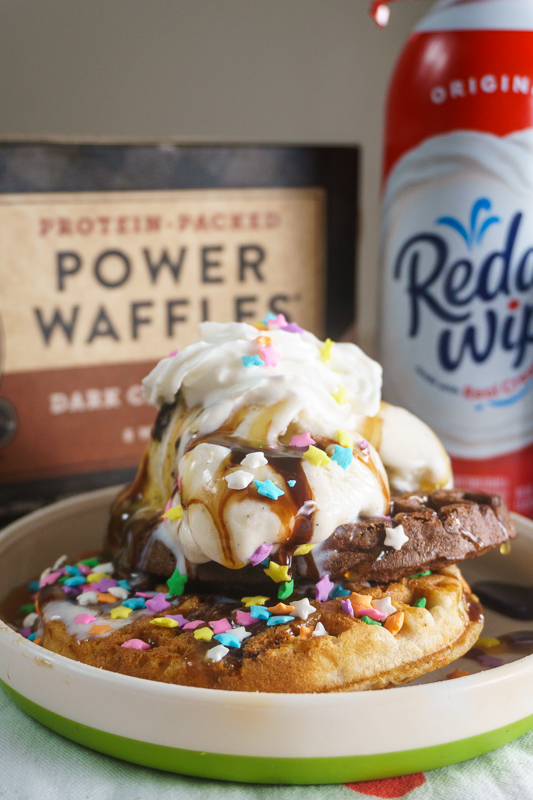 Here comes the fun part – building those waffle sundaes. 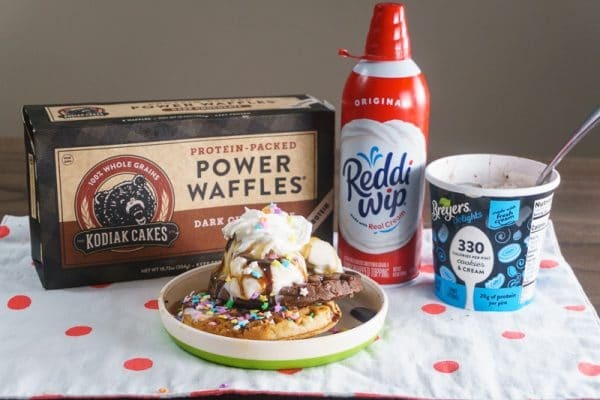 The waffles are critical of course, and these Kodiak Cakes Power Waffles come in a variety of creative flavors that are just perfect for sundae-making. I ended up layering both the Buttermilk & Vanilla and Dark Chocolate waffles for my own sundae! Then of course comes the ice cream. Again, be as creative as you want. 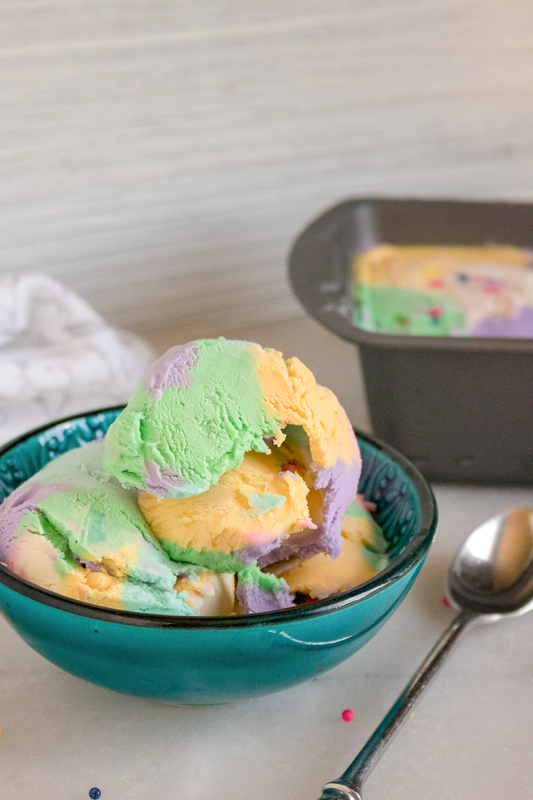 I chose Vanilla Bean, Cookies & Cream, and Mint Chip flavors to cover my family’s favorites. 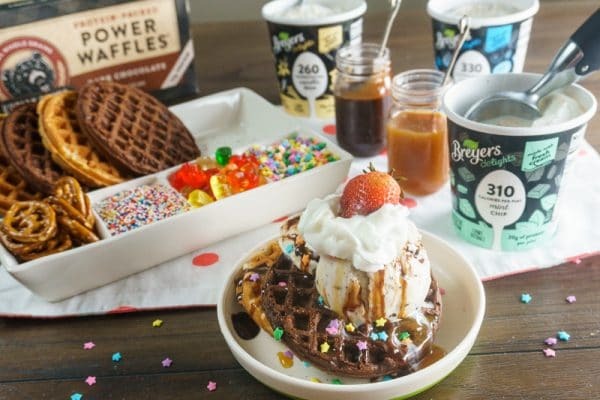 Plus since the Breyers Delights ice creams have lower calories, I could feel a bit less guilty about building a giant waffle sundae bar in my dining room. And finally, we come to the toppings. Feel free to get as creative as you want here! It’s always a good idea to include a few classics – like sprinkles and chocolate sauce. Those are always crowd pleasers. But include a few surprises too! 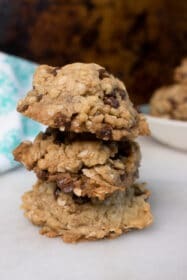 I added a delicious caramel sauce – one of my personal favorites. Then I threw in some gummy bears, because my son loves them. Plus some fresh strawberries. 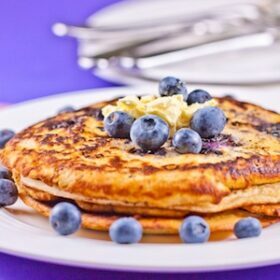 You can add any fresh fruit you like of course. I bet mango and bananas would be great additions! Don’t forget the bite sized pretzels. 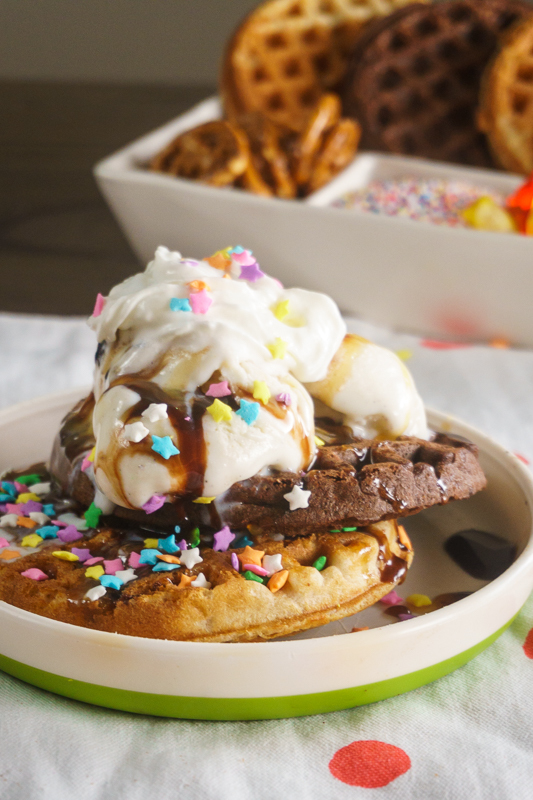 Yes, pretzels are amazing with ice cream and chocolate! And of course – don’t forget the whipped topping. Because it’s not really a sundae until you top it with some creamy goodness. I love Reddi-Wip because it’s so easy to use right out of the bottle. 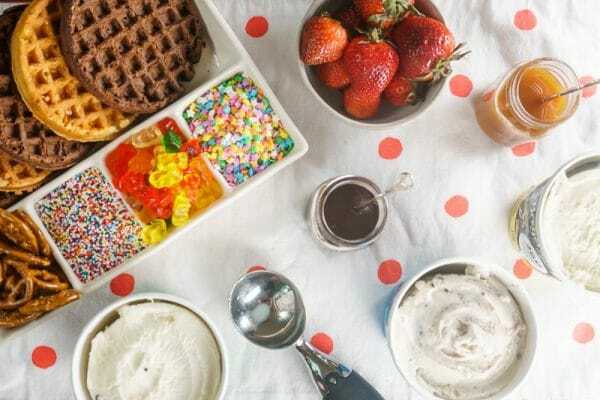 When everything is laid out, you can turn the family loose on your DIY waffle sundae bar. 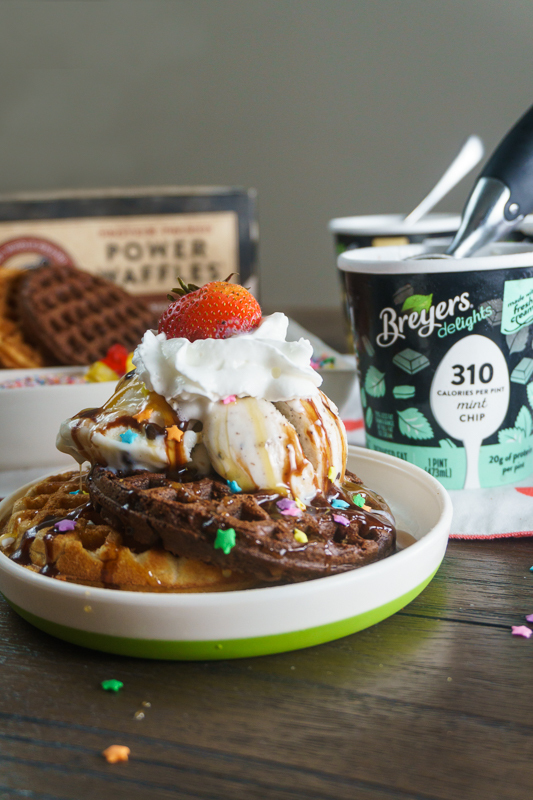 It’s so much fun to build your own waffle sundae with your favorite ice cream flavors and your own unique toppings. 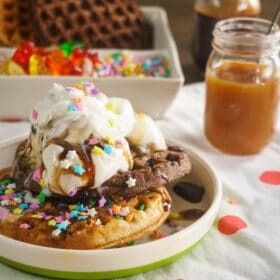 I don’t think anyone made the same waffle sundae! 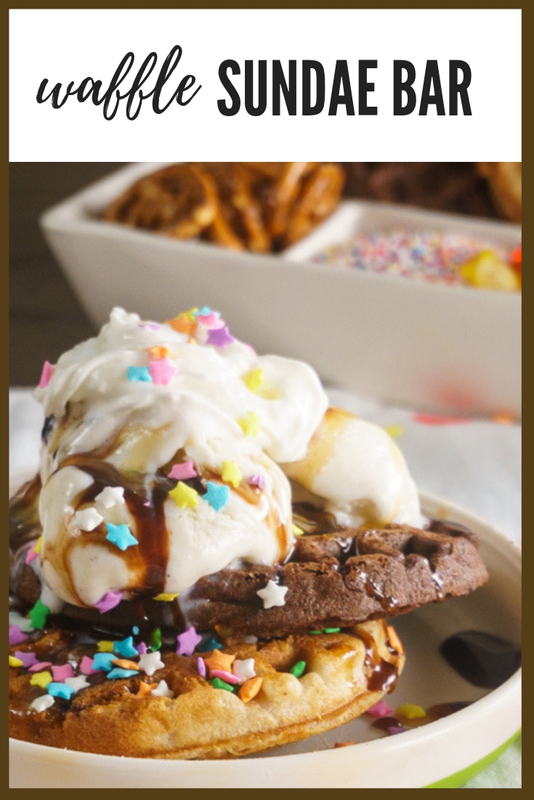 We made our waffle sundae bar for a super fun family night in. 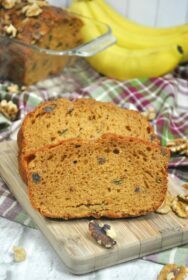 And it was perfect – super easy and a big hit with the little one. But I think it’s the perfect dessert buffet for just about any party too. With football season in full swing, I am going to be serving this at tailgate parties, with toppings in my favorite team’s colors. And it might need to make an appearance at my son’s next birthday party too. I would love to see how creative you guys get with this one! If you decide to take the waffle sundae challenge, please SHARE it on Instagram and tag me (@deliciouseveryday) so I can see your creation! And don’t forget to check out this amazing sale at Publix from 10/13-26. Visit the website to get the full list of participating items! Prepare the frozen waffles according to package directions. 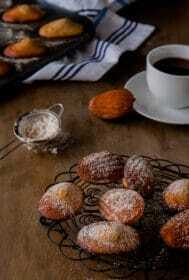 Warm the chocolate and caramel sauces. 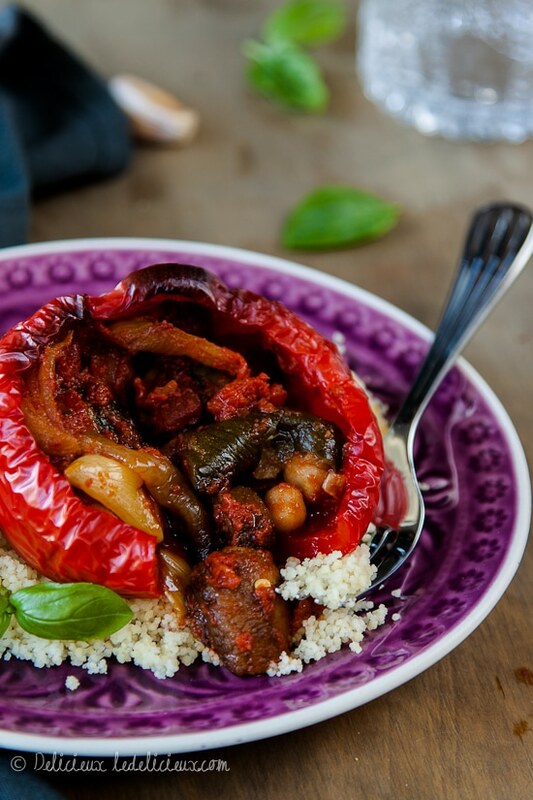 Place in a microwave-safe dish, and heat in 15 second increments until warm. 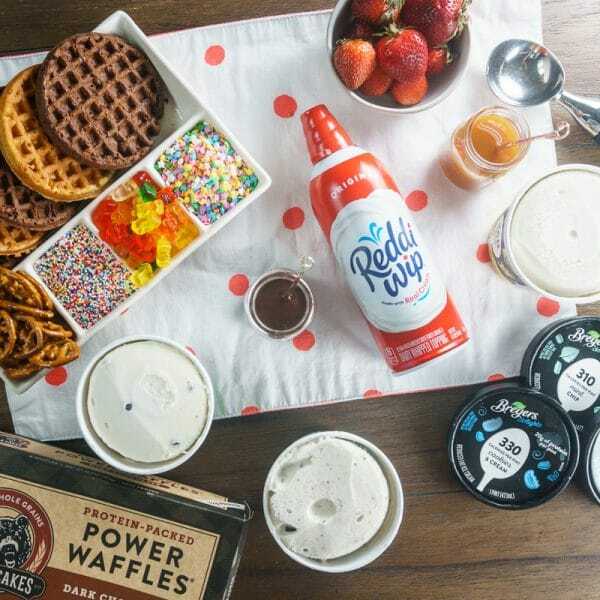 Lay out the waffles, ice creams, and toppings buffet style. 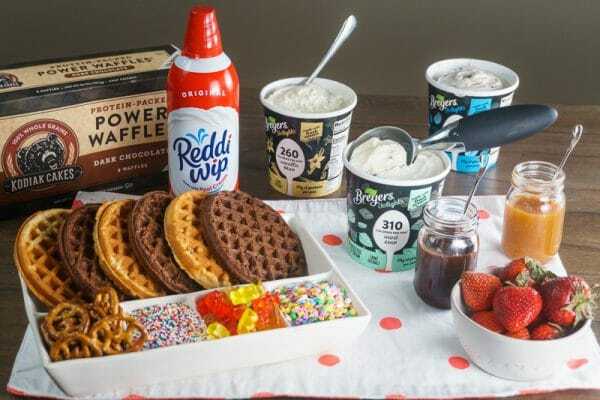 Allow your guests to build their own waffle sundaes. For each waffle sundae: Place one or two waffles on a serving dish. Top with a scoop (or three!) of your favorite ice cream. Drizzle with chocolate and/or caramel sauce. Add your favorite toppings. Top with a dollop of whipped topping.